Prairie Quilts - My slide lecture featuring Illinois farmland, woodlands and bits of remaining prairie near my home. I draw inspiration for my quilts from all the beauty I see around me. We take a tour of the land and the progression of styles I have used to create my prairie quilts for the past 30+ years. I will bring along 8-10 quilts to show. Cathy's Silk Road - This lecture traces the journey I made out east to do research for my book on silk ribbon embroidery (Published by AQS - American Quilters Society). On the trip I visited historic sites, libraries and museums to search out information and see original pieces worked in silk ribbon. It features quilts and other items embellished with silk ribbon embroidery and includes my own candid tips for making the most of traveling to do research. I will also bring along some silk ribbon pieces. An 18th Century Lady's Discourse on Plain Sewing & Fashion - This trunk show grew out of over 40 years of participation in historic fairs and festivals. I come as a seamstress from the mid-1700's and discuss the styles and clothing in fashion at that time. 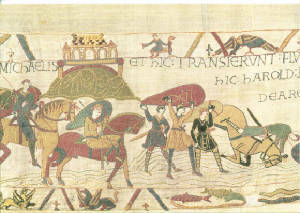 It includes a brief history of my "travels" (and travails) from Scotland to France and eventually to the New World. I give some discourse on some of the needlework popular at the time period and have antique sewing tools to show. 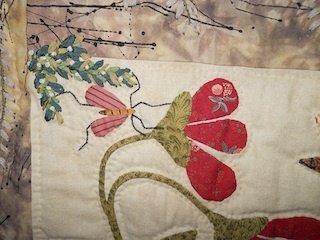 My own work as well as antique quilts, fabric and needlework will be featured. Hawaiian Quilts - A slide presentation of the flora that inspired Hawaiian women to create a unique form of applique and quilting of their own. 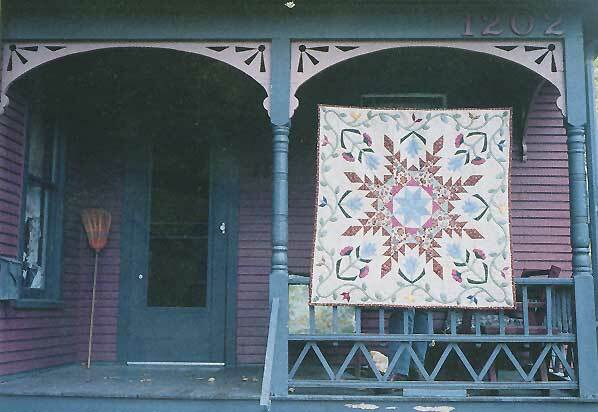 The plants and flowers that inspired these often personal quilt patterns and the quilts are featured in this presentation. 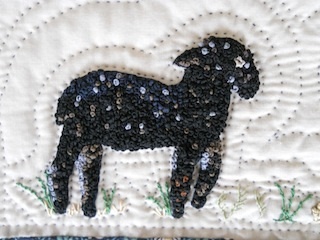 I will also talk about needle turn applique and bring along some of my own hand applique work. Needle turn demo can be included with this lecture. Wildflowers & More - Free-cut applique techniques to give you tools to create your own floral delights. Folk-art appeal includes tips on using gathered petals, layered flowers, pieced applique and folded stems. 1 day or 2 day class for retreats and festivals. Workshops: $350. for a 3-hour class and $450. for a 6-hour class + travel costs. Some workshops may be expanded to 2 days for retreats or festivals.